From the team that brought you WAMerlot on March 25, DrinkNectar, Washington Wine Report, and 12 prominent Washington wine writers are bringing Washington wine to the world through Twitter, Facebook and one hundred on location events. The June 3 event is a connection between the virtual wine tasting community using social media and wineries across the state. WAWine allows people from across the world to interact with each other while drinking and celebrating Washington wine. Wineries also use the event as a springboard to bring people together inside their tasting room. WAWine is an opportunity to learn, connect and engage regardless of where you are in the world. The event is sponsored by Washington Tasting Room Magazine and the Washington Wine Commission and will leverage the collective reach of 14 wine writers and Washington wine events Wine Rocks in Seattle, Taste Washington in Spokane and the 2010 Wine Bloggers Conference in Walla Walla. “Hundreds of wine loving eyes will be on Washington during June. This is a perfect event to kick off the month and connect people,” says the events co-creator, Josh Wade. As wine writers descend on the state, WAWine will get their palate primed for great Washington wine. The first event in the series, WAMerlot saw millions of brand impressions for Washington state merlot, over 2000 tweets from 500 people on Twitter and over 1000 people in 80 locations across the state! Leveraging the momentum from WAMerlot, WAWine will bring even greater exposure to the variety and complexity of wine that grows in Washington. 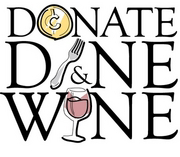 Join in person at one of the participating wineries! Follow this link to see who is hosting an event. 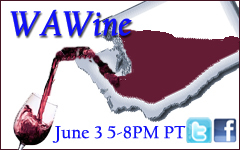 Log on to Twitter at 5pm Pacific Time on Thursday, June 3 and follow the hashtag #WAWine. To be connected with other participants be sure to use the words #WAWine in all your tweets. Lot on to Facebook and join the community at http://facebook.com/tasteandtweet. You can use this page to upload photos, share your experiences and connect with others. Visit the WAWine for Wineries page to see how you can maximize the event. We will be intentionally connecting YOU to Washington Wineries. Please register at the event site so we can connect with you, or leave a comment below. DrinkNectar.com is an independent blog dedicated to exploring wine and coffee. Using primarily video reviews, DrinkNectar begins its focus in Spokane, WA and moves out to cover the Northwest and the rest of the wine world. DrinkNectar.com began in November 2009 and is now ranked among the top 10 wine blogs in the country by traffic and engagement (according to PostRank.com/wine). Josh Wade is the editor and also contributes for Corkd.com. Washington Wine Report is an independent blog focused on bringing Washington wine to readers and bringing readers to Washington wine. The goal is to help readers select Washington wines at a variety of price levels, to keep up-to-date about the state’s wineries, vineyards, and individuals, to help plan trips to wine country and to connect people to the larger wine community. Washington Wine Report blog began in June 2007. Sean Sullivan is the editor.